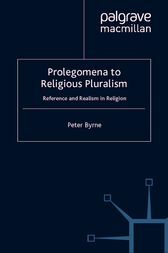 This book surveys the thesis that all religions are alike in referring and relating to a single, common transcendent and sacred reality. It treats this thesis as one in the philosophy of religion and systematically sets out its main philosophical strengths and weaknesses. The key to understanding and defending pluralism is argued to lie in a realist understanding of religion, which is defined by way of an account of the reference of names for sacred, transcendent reality.